Nadia Clifton has completed a one-year internship at the Wilson Special Collections Library as part of her ARL/SAA Mosaic Fellowship. Nadia Clifton knows that there is power in representation. That’s just one of the reasons that she is thrilled to have been selected last year for the Mosaic Program created by the Association of Research Libraries (ARL) and the Society of American Archivists (SAA). The Mosaic program is addressing the critical need of diversifying the librarianship profession, says María R. Estorino, associate University librarian for special collections and director of the Wilson Special Collections Library. “It’s a well-rounded program that provides financial support for students from historically underrepresented racial and ethnic minority groups to attend library school, helps them find a paid internship placement, creates mentorship experiences, offers fellows leadership experiences with their cohort and allows them to learn about different repositories,” she says. Nadia—who will earn her Master of Science in Library Science (MSLS) from UNC-Chapel Hill’s School of Information and Library Science in 2019—had a paid internship in the 2017-18 academic year in the Rare Book Collection in Wilson Library, thanks to her Mosaic fellowship. 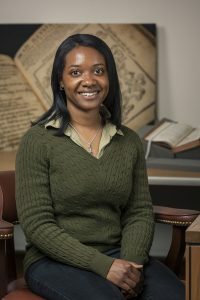 “I enjoy working in special collections, knowing that I am providing more avenues of access to the materials,” she says. The Mosaic program has offered Nadia the opportunity to strengthen her leadership and networking skills and meet colleagues through her participation in conferences including February’s 14th Annual ARL Leadership Symposium. Nadia and 34 students from the Mosaic program and other ARL fellowships and internships discussed “diversity and the difficulties we face coming into an environment that’s not diverse,” she says. “At the conference, we were able to strengthen our leadership and networking skills,” says Nadia. “And it was great to have opportunities for mentorship, coaching and résumé review from librarians and deans of library schools.” In March, the Mosaic fellows did library site visits together so they could compare public and private universities and better understand how different repositories work together. Story by Michele Lynn. Photograph by Jay Mangum.